It happens in the second paragraph of the first chapter of his first book. Peter Geye's 2010 debut, Safe from the Sea, concerns a father and son, but it quickly establishes another character: Minnesota's North Shore, hanging over Lake Superior on its way to Canada. The son, Noah, has just arrived in Duluth. Geye sets the scene: "Now he could see the lake, a dark and undulating line that rolled onto the shore. The concussions were met with a hiss as the water sieved back through the pebbled beach. The fog had a crystalline sharpness, and he could feel on his cheeks the drizzle carried by the wind. It all felt so familiar, and he thought, I resemble this place. And then, My father, he was inhabited by it." Both of those italicized statements could apply to Geye, who will be reading from his work November 29 as part of the River Readings at Augustana series. 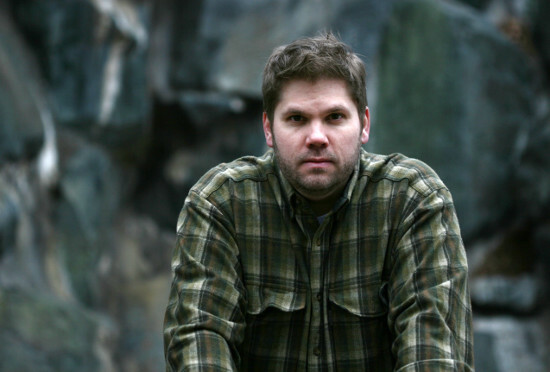 In a phone interview last week, the Minneapolis-based author discussed the importance of the North Shore and the wilderness above it as a place (to him) and a setting (for his two published novels and the one currently in progress). He said either he or his editor came up with the term "Northern Gothic" to describe his books - a descendant of the Southern Gothic of such writers as William Faulkner, Flannery O'Connor, and Cormac McCarthy. This isn't "gothic" in a horror sense, but in the way environment blends with, reflects, and influences character and action. As Bradford Morrow and Patrick McGrath wrote in The New Gothic: "[C]limate, landscape, architecture, genealogy, and psychology seem to bleed into one another until it is impossible to distinguish a figure from its metaphors." For Geye, northern Minnesota can be both unforgiving and ripe with opportunity. He said family vacations to the area inspired "this sense of awe that I've had since I was a kid. And I still have it now. ... I get this feeling in my gut when I'm there, and this sense of diminishment in myself and the people of the world. And I think that if I didn't have that, I wouldn't be so inclined to write about it. ... If you're there at the right time and the right place, you can be caught completely out of time. ... There's something pretty magical about that." The literary appeal, he said, is "that sense of a large space in a wilderness, and people trying to carve their way onto the landscape and succeeding or not succeeding to different degrees. ... Not only are the characters up against each other, but they're up against the landscape and - in the case of Lake Superior - the water. It helps to create vivid and intense fiction." That place also lends itself to professions with poetic lexicons - logging and shipping, for instance. Standard language fails to adequately capture frequently harsh and extreme conditions - the work or the topography or the weather. "I do have a habit of choosing topics that I think have a beautiful bunch of words associated with them," Geye said. "Certainly, the nautical themes have that. I think it's sort of like the first ingredient for writing: Find a bunch of beautiful words." This sort of language - attempting to "put the inexpressible into words," he said - is less descriptive than evocative, verbally painting or photographing. Beyond a man-versus-nature theme, Geye is also an incisive observer of people and towns, and a sure-footed writer. In the first pages of Safe from the Sea, the precise but seemingly casual language belies the decade the book took to write: "The manholes blowing steam might have been freeing ghosts." The first conversation we see between father and son - in a bar at 10 a.m. - efficiently sketches a soured relationship with just a few lines of mundane but telling dialogue: "I'd offer to buy you a drink," Dad says, "but you've already got your juice." And then there's the child's cutting insight: "The old man's drunkenness had always struck Noah as cumulative. ... [T]he years had surely added up to something, to some soggy history that diminished the old man." The 42-year-old Geye said his first novel required 10 drafts over those 10 years - figuring out what the book was about, but also learning to write as he went along. Because he and his father had and have a close, healthy bond, he said, writing about a fractured relationship was initially a challenge. Writers are taught nearly universally, after all, to write what they know. "I was just learning at that point in my writing life to trust my imagination, and to let those conversations happen outside of my experience," he said. "Once I started trusting my instincts ... I felt like I had license to do whatever I wanted," and it was easier to "imagine a life sort of the exact opposite of mine." The Lighthouse Road - his second novel, published last month - took only two years and fewer drafts. The seed was a photograph of a woman standing outside the mess hall at a logging camp, found in a book he regularly thumbed through while writing Safe from the Sea. "Every time I came to this picture," he said. "I would just stop for a minute or 10 minutes and look at her face and sort of imagine what life would be like for her. She looked terrified to me. She looked scared, and she looked lonely. She looked desperate. I didn't necessarily realize that I was doing this each time I stopped there, but I was creating a whole life for her. Right away I assigned her immigrant status. And right away I assigned her all-alone-in-the-world status." After that, Geye said, it became a matter of asking and answering basic questions: Where did she come from? Whom was she expecting to see? Why was she expecting to see them? Who was there instead? "It's a simple association game for me." He said that unlike with his debut, he crafted blueprints for The Lighthouse Road: "I didn't want to spend another 10 years writing a second book." But the novel still evolved, and Geye noted that he wouldn't want to imagine and plan a book to the extent that actually writing it became rote. "Almost every time I sit down to write, I think: I've got to get a better plan, I've got to get more organized," he said. "Part of the reason I never get around to doing that is because as much of the pleasure comes for me in the discovery as it does in the execution. In much the same way that I enjoy reading, I enjoy writing. That is: I want to be surprised, I want to make the discoveries and connect the dots as I'm going along." So The Lighthouse Road begins in 1896 with the woman that Geye created from the photograph in labor during a blizzard: "Some ancient cold had taken root in Thea Eide's belly, a feeling she'd not yet had but one she knew meant the time was nigh to deliver her baby." The next chapter, set in 1920, concerns Odd (pronounced "Ode") - that baby at age 23, preparing to transport six barrels of hooch from Canada to Minnesota on a stormy Superior. "I knew that he would be born," he added. But Thea's death - noted in the first chapter, so I'm not spoiling anything - raised the question of what her son's life would be like. "I really got into it when I saw the ways that their lives were amplifying each other's and illuminating each other's," Geye said. It's not just Odd's presence that was unexpected to the book's author, but his sterling nature. Geye said he wanted to write a bunch of "complicated, doubled-edged characters," such as Hosea Grimm, whom we first meet delivering Eide's baby and next see hung over in a Chicago brothel, where's he about to purchase a 13-year-old orphan girl who will eventually become Odd's lover Rebekah. Geye described Odd "as the man that I wish that I was" - diligent, honest, committed. Some critics have found him too pure and consequently dull, and the author said he understands that judgment. But he added that Odd functions as a contrast: "I find that fascinating, that someone could be so good and so true. ... I think he's interesting sort of precisely because of that, and also because he's surrounded by such contrary characters. He's the foil to the bad guys." Odd has "these qualities of character that are a little bit out-of-tune with the rest of the characters in the book. ... I also think that there's a place for people like that, in the world and in literature ... - the way in which they can play off the more ambiguous characters." The Lighthouse Road is presented nonlinearly and was composed modularly, Geye said. He wrote more slowly, and when he finished a chapter initially, he said, it was much closer to being "finished" than with early drafts of Safe from the Sea. "Much of the revision for The Lighthouse Road came in reorganizing the way the story came to life, and the way things evolved and things were disclosed," he said. What ended up being the third chapter - the one that gives the origin story of the relationship between Hosea and his "adopted" daughter Rebekah - was initially in the final third of the book. That late revelation, Geye said, "came to seem pretty artificial - the withholding of that. Then when I read it with that at the beginning, it just seemed more natural and organic, and less like I was playing games with the reader." He further cited the example of revealing earlier how Odd got his glass eye. "I always thought of it [the book] as a mosaic as opposed to just a jumping back and forth," he said. "I thought one of the benefits of writing a book this way is that I could play with it ... , and tease out the natural suspense versus any sort of artificial and authorial suspense that might have gotten in the way of it." Geye is now working on a more-straightforward father/son adventure story - set in the wilderness north of Lake Superior's North Shore. He said that even though his publisher - Unbridled Books - is a small, literary outfit, he feels an obligation that wasn't there when he spent his 30s on his first novel. "There's a whole bunch of books that I want to write," he said. "I'm not an old man by any stretch of the imagination, but I know I'm not going to be on Earth forever. And part of it is a sense of urgency to get the stories down that I want to get down. ... Part of it is a professional decision. ... There's a fan base now that there wasn't when I was writing Safe from the Sea. ... I have to be especially conscious of my professional life, making sure that I'm staying active and making sure that my little stable of fans is satisfied and stays interested in me, or I'm not going to be able to publish books. ... I have to keep working." Peter Geye will read from his work on Thursday, November 29, in Augustana College's Wallenberg Hall (inside Denkmann Hall, 3520 Seventh Avenue in Rock Island). The 7 p.m. event will be followed by a reception and book-signing. For more information on Peter Geye, visit PeterGeye.com.